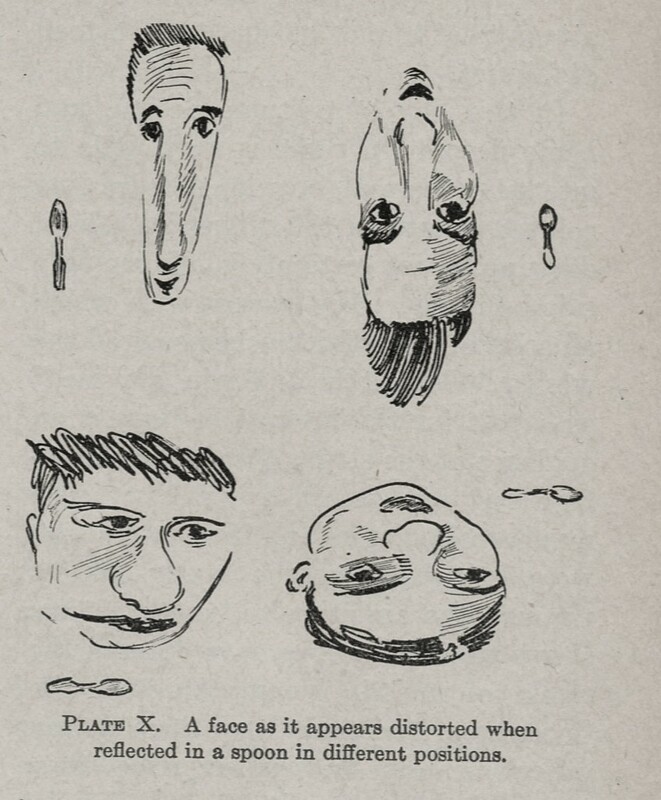 Since Grandma didn’t write anything a hundred years ago today, I thought that you might enjoy some pictures and quotes from an article about how to draw caricatures that appeared in a hundred-year-old magazine for art teachers. Caricature will furnish a legitimate outlet for the energy that creates disorder in the school. 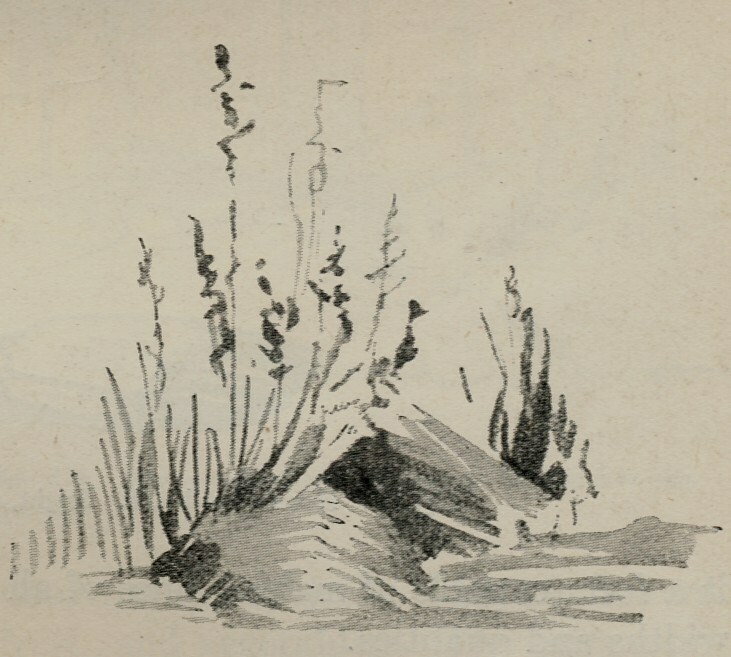 The study of humorous drawing develops the ability to make jokes. 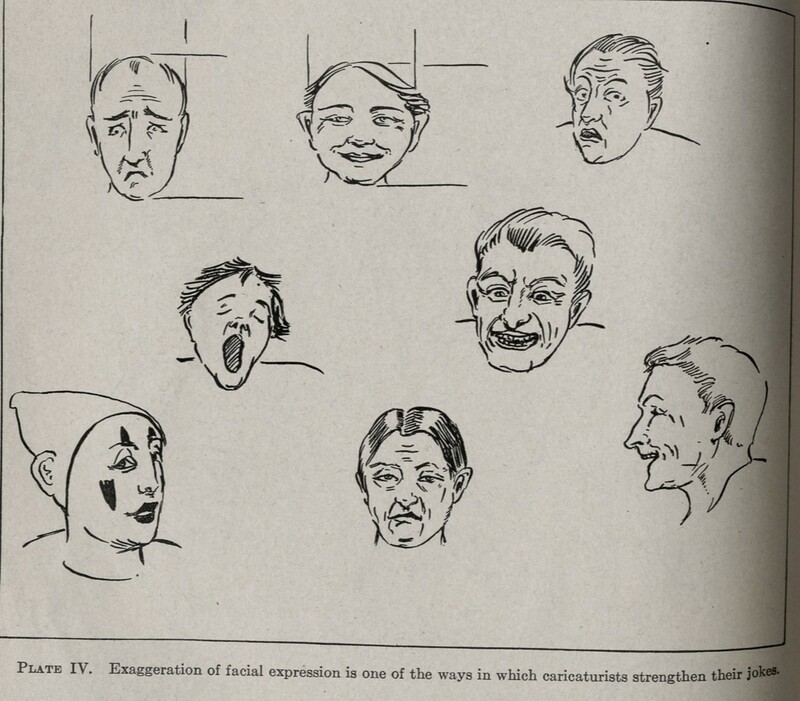 The teaching of caricature does not necessarily result directly in successful jokes in the classroom; it bears its best fruit in the increased skill and appreciation of the pupils. In this respect the teaching of caricature does not differ from any other lesson. Youthful caricaturists need to be taught that kindness should be their guide in making a selection of the qualities which they exaggerate, and that the best sense of humor is that which we call good humor. Clever boys especially are inclined to be cruel in their attempts at jokes; they need training to see that deformity, ignorance, and misfortune are pitiful rather than funny, that a joke must be considered from the point of view of the person joked as well as from that of the joker, that the greatest of strength lies in its gentleness. Teach a child what is really funny and he will scorn to perpetrate, or even to tolerate, laughter at what is not. So through, the study of humor the teacher can make his worst enemy serve as his best friend. Since Grandma didn’t write anything a hundred years ago today, I’m going to share how I made a shrunken apple-head witch. The October, 1913 issue of Ladies Home Journal had an article with suggestions for Halloween parties. 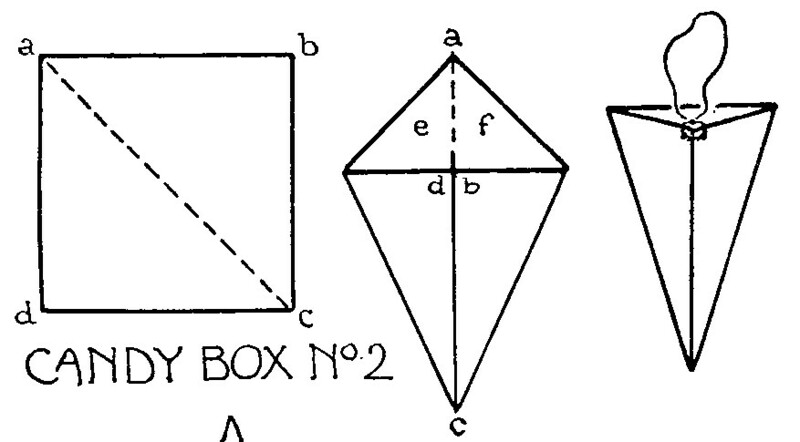 It included the following picture. Unfortunately the magazine didn’t provide directions for making the apple head witch, and instead said that if you wanted directions for making the “novelties” shown that you should send a stamped self-addressed envelope to the Entertainment Editor—so I was on my own when it came to interpreting the picture. First I made the shrunken apple head face. To make it I followed the directions in a wonderful YouTube video on how to carve apple heads. It also showed how to dry them in the oven. I used a popsicle stick and nail that I taped together to create the skeleton. 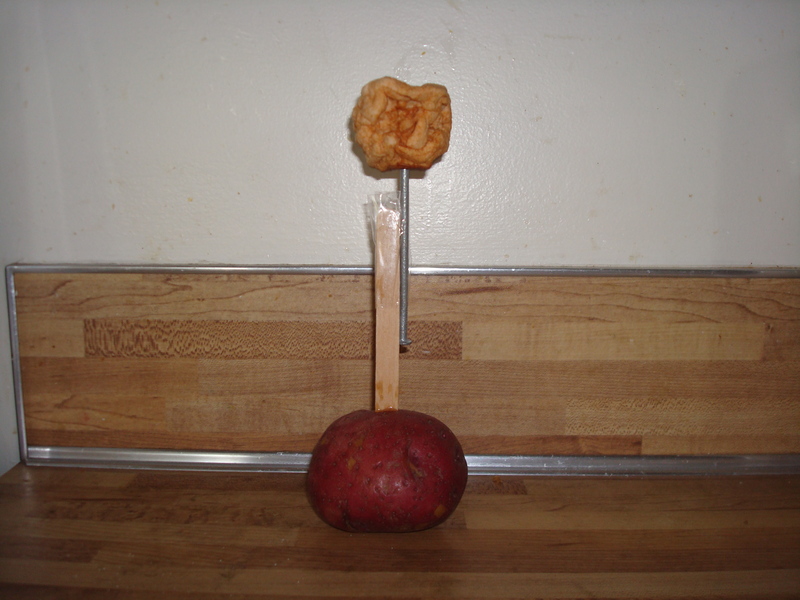 I stuck the sharp end of the nail into the base of the dried apple, and the popsicle stick into a potato. I then made the outfit using felt and staples. I didn’t like the way it looked when the potato based stuck out beneath the clothes—so I made the dress longer than in the old picture. 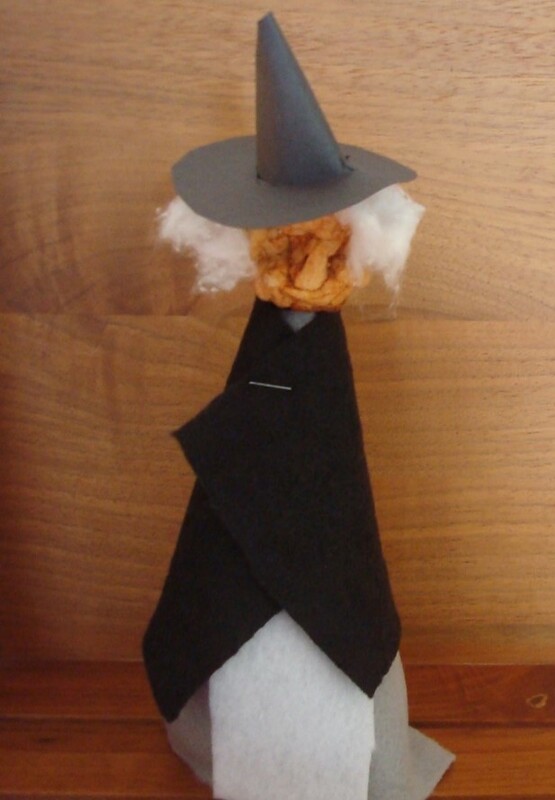 I used a part of a cotton ball to make the witch’s hair, and made the hat out of black construction paper. The hat didn’t want to stay in place when I put it on the witch, so I broke a tooth pick in half and inserted it into the top of the head. 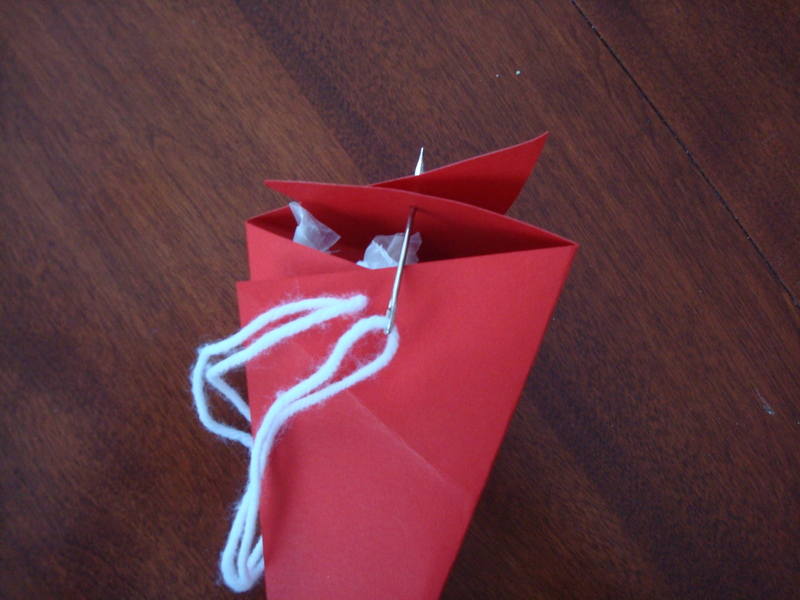 I then placed the hat over the tooth pick. 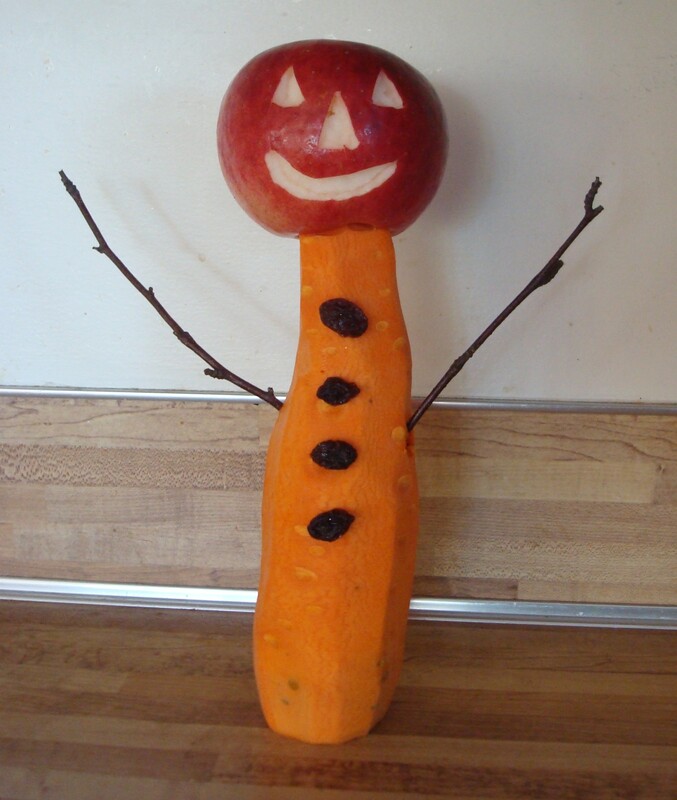 Last year I made the carrot bogeyman that is in the old Ladies Home Journal picture. Click on the link to see that post. 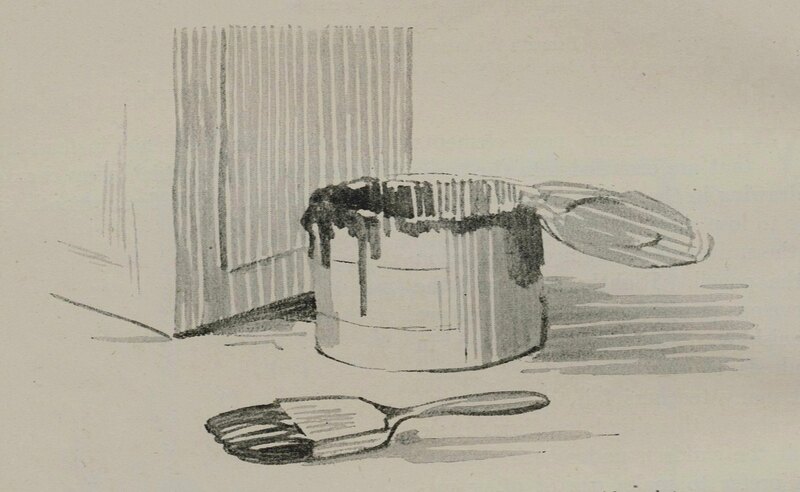 Tuesday, October 28, 1913: Working away as usual. Hmm. . . Grandma wasn’t exactly doing her usual work. She and her sister Ruth were preparing to host a Halloween party. The previous day they sent invitations to friends. Were they making any Halloween decorations? . 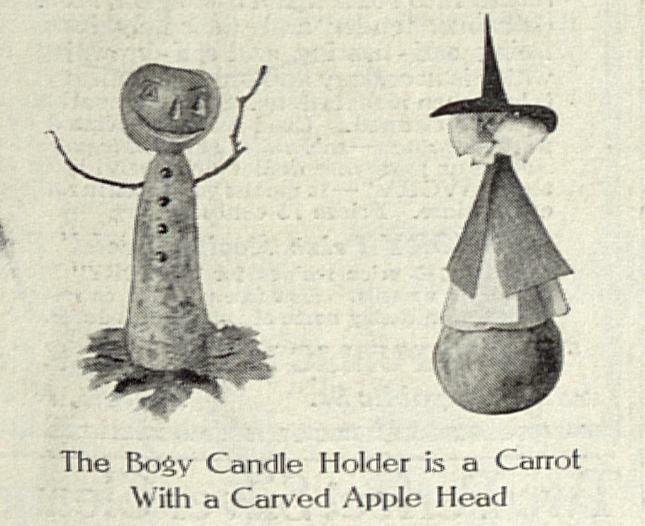 . . Maybe the carrot and apple head bogeyman shown in the October, 1913 issue of Ladies Home Journal? I’m a bit foggy about why the magazine caption calls the bogeyman a candle holder since I don’t seen any candles in the picture. 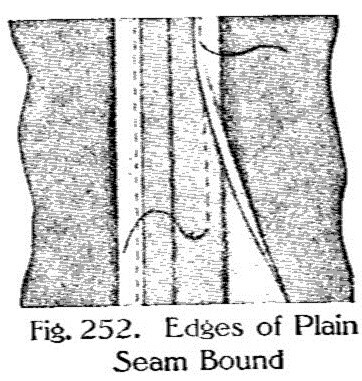 The magazine didn’t provide directions for making the bogeyman, and instead said that if you wanted directions for making the “novelties” shown that you should send a stamped self-addressed envelope to the Entertainment Editor. I bought some old-fashioned fat carrots (and some apples) at the farmer’s market. I carved a jack-o-lantern face on the apple and then cut a round hole about 1-inch in diameter and 1-inch deep in the bottom of the apple. I dipped the carved face in lemon juice so that it wouldn’t turn brown. I peeled the carrot and cut the bottom off so that it would sit flat. I then cut away part of the top of the carrot to create narrower piece that could be inserted into the bottom of the apple. I also cut notches on each side of the carrot for the twig arms. I then assembled the bogeyman. The “buttons” on the front of the carrot are raisins that I attached using pins. 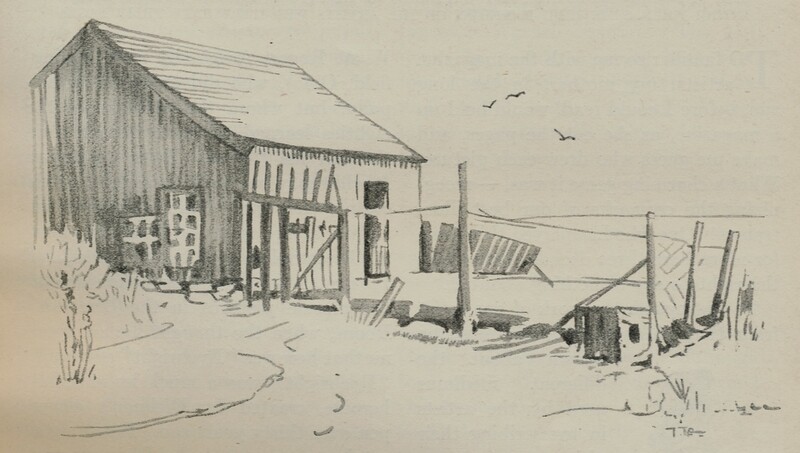 Thursday, July 24, 1913: This afternoon seemed so long to me because it rained for a long while. Grandma—I know that the afternoon seemed long, but you must have done something. What did you do? I want to imagine that you played with your 7-year-old brother Jimmie on this rainy afternoon. Did you ever make crafts with him? 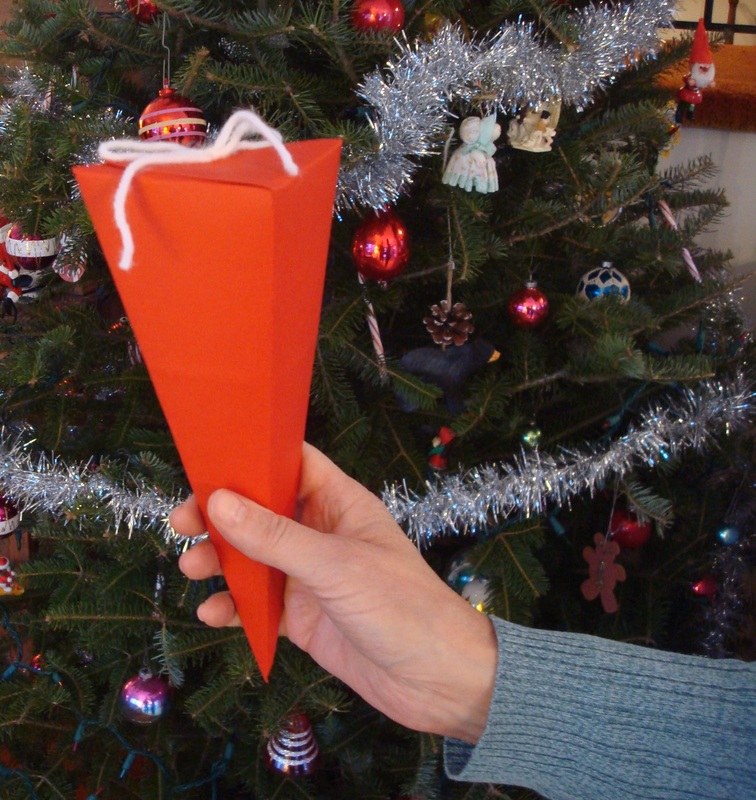 I love some of the very simple—but fun– paper crafts that people made years ago. 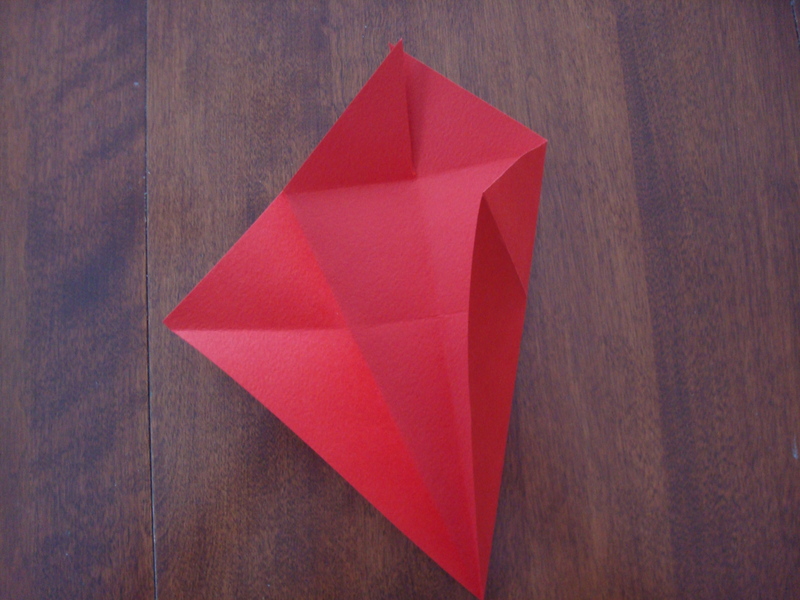 Often the crafts were very creative and used very basic techniques. 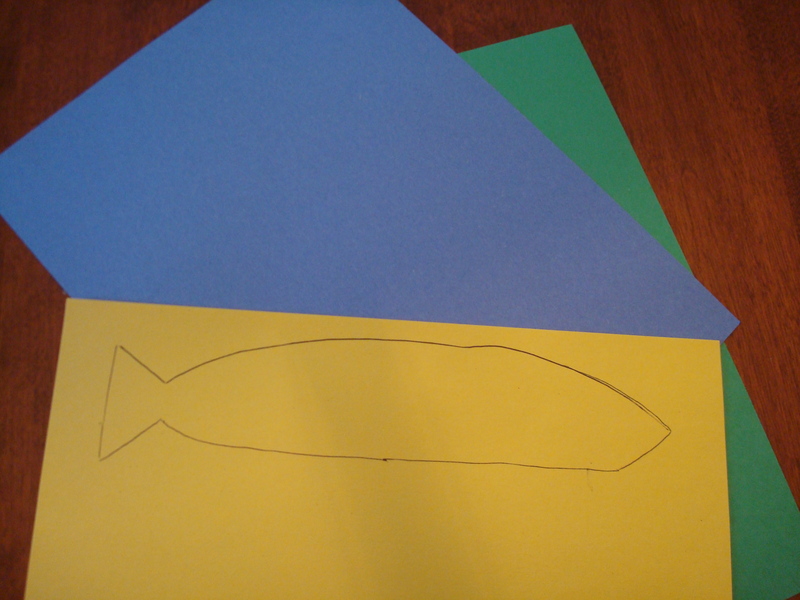 For example, here are easy directions for making a paper fish. 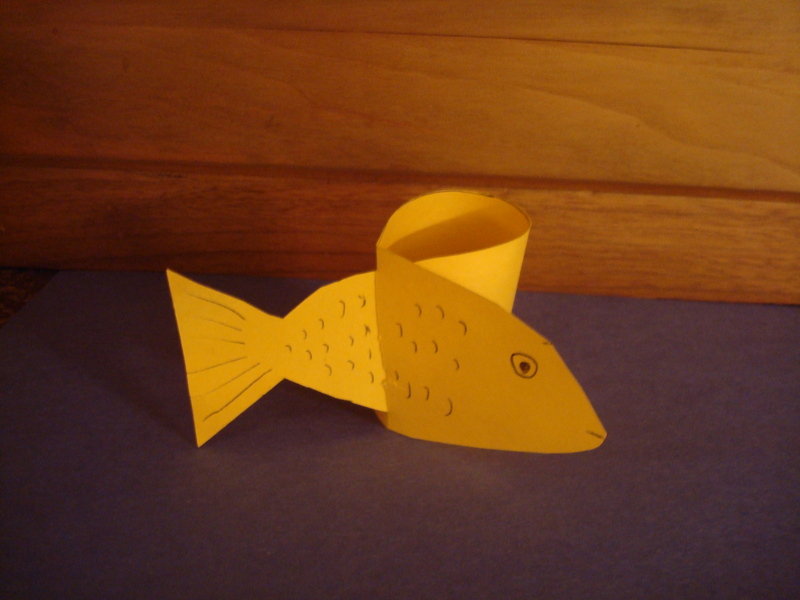 Draw a fish on a piece of paper. The body of the fish should be very long. 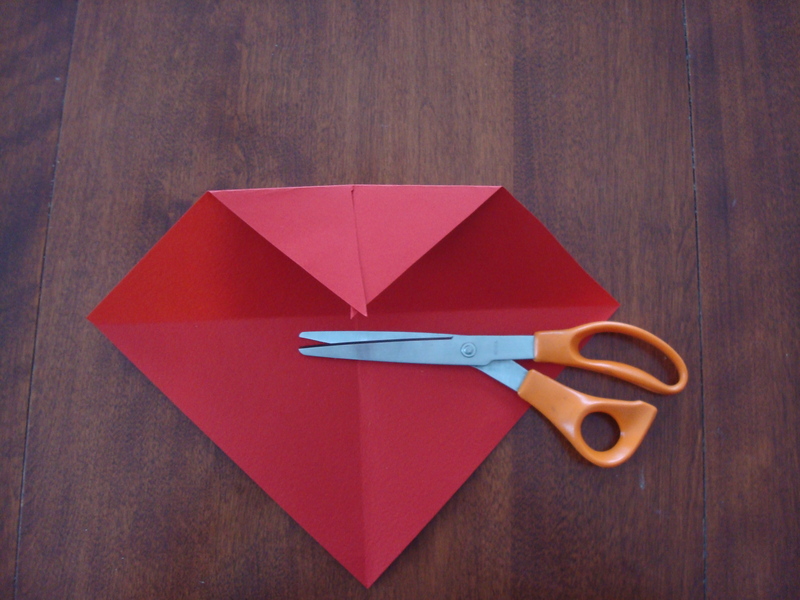 Cut the fish out. 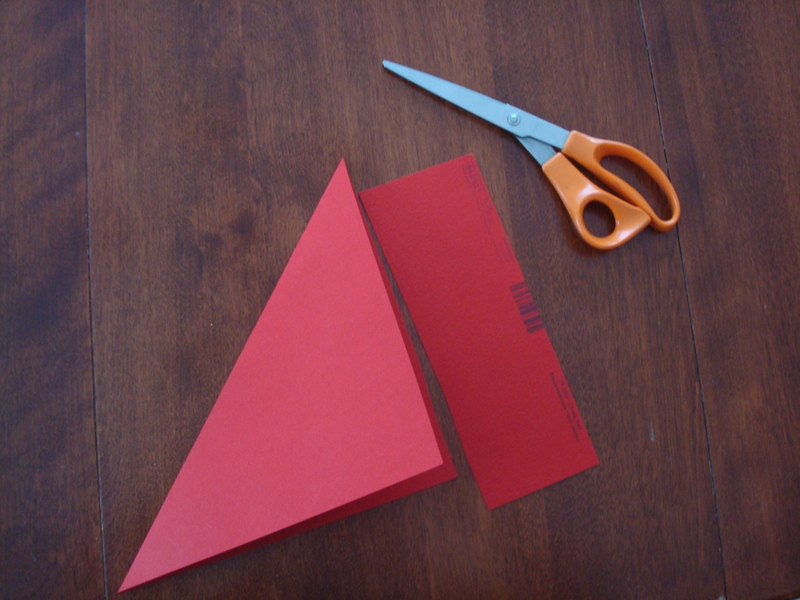 About one-third of the way back from the head cut a slit in the paper. 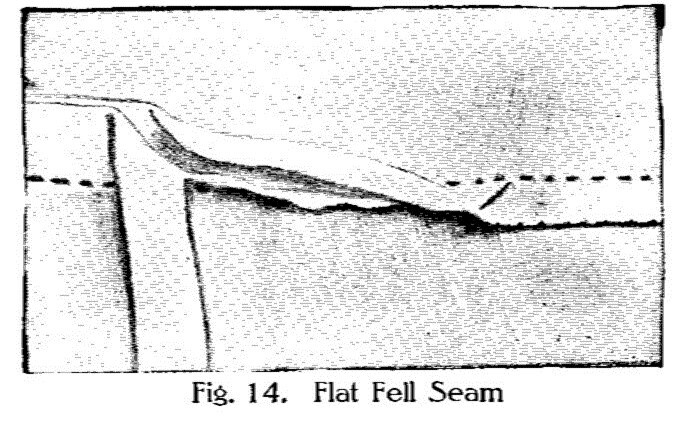 Put the tail through the slit. 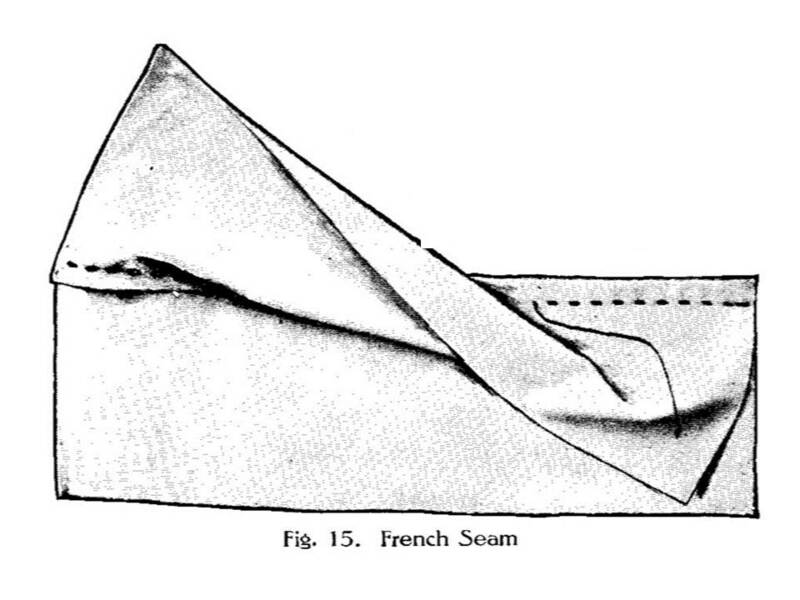 (You may need to gently fold the tail to get it through the hole). Decorate as desired.